Users might receive below error during the SQLServer failover cluster installation. Cluster network name resource SQLINST1' failed to create its associated computer object in domain ‘test.domain.com' for the following reason: Unable to create computer account. - The cluster identity 'SQLCLUSTER$' can create computer objects. By default all computer objects are created in the 'Computers' container; consult the domain administrator if this location has been changed. - If there is an existing computer object, verify the Cluster Identity 'SQLCLUSTER$' has 'Full Control' permission to that computer object using the Active Directory Users and Computers tool. You will receive above error because the user that you are running the installation does not have proper privileages to create computer object in the domain. Ask your system admin either grant the permissions or create the computer object in advance. Once your System admin creates the computer object, you retry the installation and It should work successfully. User might see below error when trying to failover the SQLServer instance from one node to another node. User might have recently installed a SQLServer cluster which has more than 1 node. The main reason for this error is the node where you are trying to failover might NOT the owner. 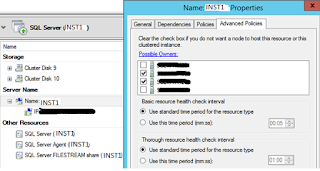 You need to verify all nodes in the Cluster are selected as Owenrs under “SQLServer Virtual Name” properties. 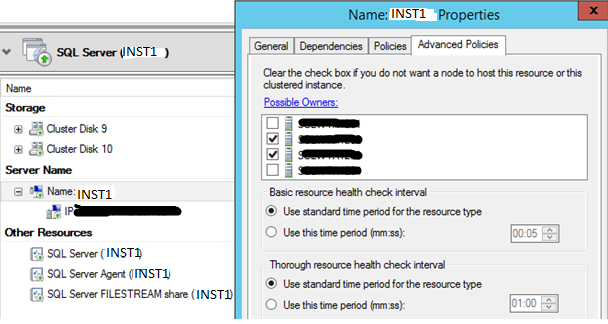 As you see below screen shot, 2 nodes are not not part of the cluster . Once you check the box you will be able to failover SUCCESSFULLY without any issues.